How Much Percentage of Body Fat Should a Woman Have? 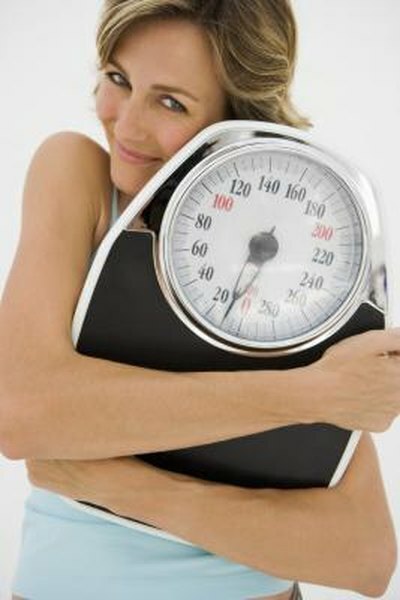 Your ideal body weight can be roughly estimated based on your height and body frame size. Muscle mass, on the other hand, isn’t as easily determined, especially when referring to an ideal. Because muscle mass isn’t a good indicator of health, it’s better to look at your body fat percentage or waist circumference to determine your risk of certain health complications. The National Institutes of Health provides a rough estimate of desirable body weight for height. Women should weigh approximately 100 lbs. at 5 feet and then another 5 lbs. for each inch over this height. Men should weigh a bit more, coming in at 106 lbs. at 5 feet and then an extra 6 lbs. for each inch over this height. This means at a height of 5 feet 10 inches tall, a female should weigh around 150 lbs., whereas a male should weigh 166 lbs. The NIH's calculation for ideal weight doesn’t account for differences in body frame size. The NIH's numbers are based on a medium-sized frame. People with small frames should deduct 10 percent from the NIH's desirable weight, while 10 percent is added for those with large frames. Females are considered to have a small frame if their wrist measures less than 5 ½ inches at a height of under 5-foot-2, less than 6 inches at a height between 5-foot-2 and 5-foot-5 and less that 6 ¼ at a height over 5-foot-5. Women are classified as having a large frame when wrist size is greater than 5 ¾ at a height of under 5-foot-2, greater than 6 ¼ inches at a height between 5-foot-2 and 5-foot-5 and less that 6 ½ at a height over 5-foot-5. A small frame for men is usually a wrist size of less than 6 ½ inches and a large frame is a measurement over 7 ½. Unlike weight, muscle mass doesn’t have a so-called ideal based on your height or even body frame size. In fact, muscle mass varies greatly from person to person, based largely on physical activity. Instead of focusing on muscle itself, most medical professionals defer to body fat to determine if your muscle mass is at an ideal percentage for your height. Women should have a body fat percentage somewhere between 20 and 21 percent. Men should have far less, coming in at 13 to 17 percent. Talk to a doctor or physiologist to determine this percentage. Besides body weight and body fat percentage, it’s also important to look at your distribution of body fat, explains the National Institute of Diabetes and Digestive and Kidney Diseases. It’s especially problematic for people to carry excess fat around their midsection. When women have a waist circumference over 35 inches, it places them at a greater risk of developing high blood pressure, high blood cholesterol, heart disease and type 2 diabetes. For men, these risks increase with a waistline of over 40 inches. Rush University Medical Center: What is a Healthy Weight? How Much Sodium Is Allowed in One Day on a Low Sodium Diet? What Percentage of Body Weight Should You Be Able to Deadlift?